Superman Returns is to get a sequel. And hopefully a title which is not "Superman Returns 2". Here's an article which I was directed to courtesy of Superman Homepage. We’ve been told that Superman will have the battle of his life in the sequel and audiences can expect one of the ultimate baddies in the D.C. universe to come to Metropolis to pick a fight with the Man of Steel. I think a Doomsday or Bizarro scenario is probably most likely with Luthor wrapped up in the movie. But Metallo... Ah, heck. I don't know. Just glad I'm getting more Superman on the big screen. Of course I'd love to see Darkseid, but he brings a whole lot more baggage than I think the movie can handle. 11 years, Skipping Town, Good-bye Spider-Man? I have promised Jamie I will go to bed in 15 minutes. I suspect that even when I told her this, I knew it to be a lie. We are headed out for Houston tomorrow. A quick trip. We're off to see Richard W. of our merry, hazy days of higher education join in holy matrimony with a girl I've met twice. Once, while I was eating squash. We are at that age now, when even the Richard W.s of the world are making honest women of their long-suffering girlfriends, the Peabo's have stumbled into fatherhood and some of us realize that Sunday marks the 11th year of togetherness with our significant other. 11 years. Can you dig it? The only other folks who I can think of topping this in my age bracket are: Jen & Reedo and Shannon & Josh. a) I have no advice to give anybody in the dating pool. Especially when one considers my dating record prior to Jamie. So, you know, don't bring me your dating stories of woe. I will give you the jaded/clear-eyed instructions of a long-burdened grouch who thinks you're over-thinking things. d) having someone on hand who can now account for more than 1/3rd of my life. One of the curious items about returning to Austin is the reconnection with folks and realizing how long you have known them. JAL stopped by the Sunday cookout, and I introduced him as "a guy I played soccer with in 4th grade". Patricio stopped by, and I explained "I met Pat in the dorms in '93. 13 years ago." Other Leaguers include Nathan, who I met longer ago than '93. I believe '91 (I need to schedule the Nathans up to Austin for a visit...). Reedo I met as far back as '86 or '87. Mangum, I'd hazard to say I met in '95, but whom I got to know in '96 when he criticized not my choice of bands, but the fact that I wasn't listening to HIS favorite Talking heads album when he stopped by. The criticism goes on to this day. Today Jamie I had lunch with a former co-worker we have in common, Les B. Les B. worked with me at UT, and, later, with Jamie at Human Code. I have known Les since '97. That's 9 years. Les is doing well, cut off a goodly chunk of his hair, runs a recording studio behind TFB on SoCo, and is still very much Les. The League is getting old. We are getting old, all of us. Time to start picking those items on your list you really DO want to do before merging with the infinite. Mine involves having my own game show. Preferably inheriting "The Price is Right" when Barker retires. Today I was unpacking previously untouched crates full of my "collectibles" and had a brief moment of clarity. I appear to have collected a lot of Spider-Man action figures at some point. I do not remember intentionally collecting Spider-Man toys. I like Spider-Man. He's neat. But I don't necessarily want a room full of Spider-Man toys. I think. The correct answer is: Sell it on eBay, I think. There's a "Will Sell Your Stuff on eBay" shop not to far from my house. I think it will be devoid of foxy Catherine Keener-like shopkeeps, but I am considering bringing the a portion of the collection down there before I get a job. Jamie likes it when I sell my stuff and I have money. But then she wants to spend the money on luxury items like food and electricity. Is it truly growing up to be able to say goodbye to your Electro action figure? One could make a case. But that one probably also didn't just hand Superman wallpaper border in their office. I'm not sure what to call it. Let's call it "Ned". I am now late for bed. We had dinner this evening with a former elementary/middle school/ high school classmate of mine, Hilary, and her husband. I'd had coffee with Hilary shortly after arriving in town, and we finally found a day when we could meet up and grab some chow. Hilary and Stuart are musicians and play a lot locally and around the state. You can see their band's website here. It's funny. I don't think I've been in contact with Hilary much more than a few sporadic e-mails since May of 1993 or so, but it's fun seeing her. And also, it's nice that her husband seems like a genuinely good guy (but what dark secret does he hold..?). I imagine she will get looped in to the Friends of The League, whether she likes it or not. Aside from that, today we brought the dogs in to the vet (so far everyone has a clean bill of health, but Mel's lab work is being processed). Lucy has fought ear inections her entire life, but I think I have newfound faith in our newfound vet to get the fun in Lucy's ear canal under control. 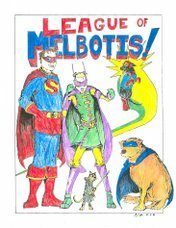 Here's the big news: Melbotis is down to a svelte 94 pounds. He is even lighter than he was when we first showed up to join our family. He's been eating less and exercising. Mel weighed 117 at his last weigh-in, so we're all very proud of the work Mel has done to become a tinier dog. There's a moral in there, somewhere. The only sad part is that I can no longer tell people "My dog is over 100 pounds". I also got some shelving material which I want to hang, but I need a "stud finder". I am 98% positive The Admiral or Dr. McB got me a very expensive electronic stud finder circa 2002, but I can't find it in my boxes in the garage. The problem is this: If I DON'T have one (that 2%), I need an electronic stud finder. If I have one, then I need to find it. If I have one, I COULD go buy a cheap, old-fashioned magnetic stud finder, but those don't usually work terribly well. What to do? I certainly don't want to drop $45 on an electronic stud finder if I own one. Oh, and I took a large poster in to get it framed. a) Michael's doesn't carry glass big enough to handle the job, and won't frame anything that large with glass, anyway. I had to go buy my own plexiglass. c)Today I was in the neighborhood of Michael's and popped in to see how they were coming along. We need to "drymount" the poster to foam core (if you don't, eventually teh poster will sag in the frame). Now I learn Michael's doesn't carry foamcore large enough to match my poster. They were planning to seam two pieces together, leaving a crease in the picture. Apparently, some Michael's employees would rather jack up your poster than get the right materials. Luckily, the girl working there took me aside and said "do not let this happen". Unluckily, she just moved here from Detroit and doesn't know were to get foam core. Luckily, I do. d)I made one call to a local establishment with whom I had once done business, and I now have to go buy my own foam core. e) Nonetheless, I'm irritated that I am STILL paying Michael's ANYTHING for this job. I shall have a long conversation with the framing manager before all is said and done if I do not get a significant refund. This weekend was okay. Saturday was fairly quiet as we tidied and I fought off a world-class headache all day. I think that my caffeine consumption is somehow triggering these headaches, but I can't tell if I'm taking in too much or too little coffee. Jason came over for dinner and we tried out "Culver's" down on William Cannon. Culver's is the sort of place you can go to once in a blue moon, not because its expensive, but because your arteries can only handle so much grease before hardening like little shoots of concrete. So, you know, maybe we'll go back at some point, but if my doctor has anything to say about it, nothing too soon. We then came back to the house and watched a good portion of "Faster Pussycat! Kill! Kill!" which I am ashamed to admit I'd never seen before. You know, that Russ Meyer guy... he knows what he likes. You have to admire his very clear vision. I think. So TODAY we woke up, tidied up the place and fired up the grill. Several Loyal Leaguers and Friends of the League were in attendance, including Steanso, Harms, JAL, several members of my old office, and, in a special cameo, Patricio. It was our first real shot at doing any entertaining in the new HQ, and I have to say, I think the layout here is very good for entertaining. Open. Almost enough seating, and the distinct possibility of breaking off into separate seating areas, should folks NOT want to hear geeky dissections of technology and tech strategy. All in all, a marvelous day. I do believe that we shall now entertain the idea of a League Holiday Spectacular. Expect an announcement shortly. Thanks to all who showed up. You made us feel very at home here back in The City of the Violet Crown. And if you didn't show up (La La), well, gee... that's okay, too. We can always fire up the grill some other time. Steven and JAL managed to wear out the dogs. They were both asleep by 8:30 tonight. An extra special thank-you is extended your direction.